MacBook and/or MacBook Air: Neither of Apple’s older laptops has been updated since 2016 (see “Apple Updates 12-inch MacBook, Bumps MacBook Air RAM,” 19 April 2016), and even then, the MacBook Air was woefully outdated and the basic MacBook never truly up to snuff. Bloomberg suggests Apple is looking to replace the MacBook Air, which would be appreciated by those who prefer smaller and less expensive laptops. 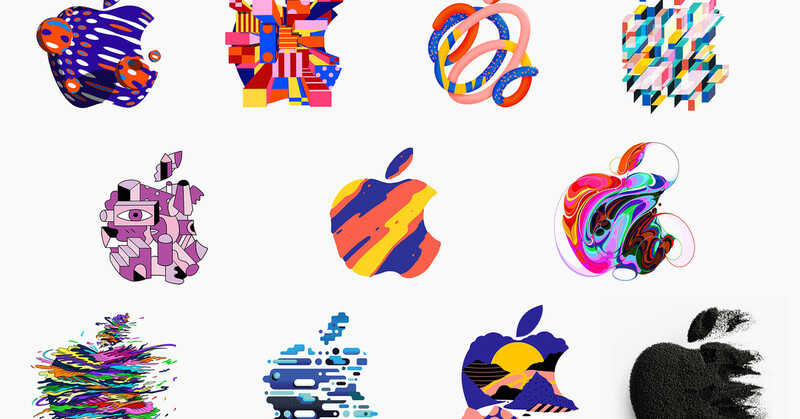 The Apple logo has never looked this good. The logos, the choice of Brooklyn… this is all about the professional creative. Here’s hoping it’s a new Pro/Mini, I’m still betting they’re merging those two lines. The existing Pro machines - the iMac Pro and the MacBook Pro - If it’s a refresh of them it’s an incremental update. Might be a few surprises but probably not. A Pro 9.7" iPad would be nice to see though. I linked to a BusinessInsider article in our piece that connects many of them. Now if only we could get a poster with all the logo variants! When they announced one of the first Apple Stores would be located in Soho in NYC rather than in Midtown, just about everyone who didn’t work in a creative field thought it was nuts. This will be a great idea. I’m semi retired now and don’t need to drag a MacBook Pro around much anymore, so I’m definitely hoping for a Mini Pro. I’m hoping that sometime in the not too distant future iPad Pros will be able to run stuff like Photoshop and replace MacBook Pros. I’ve been checking out links from other sites too, and it seems possible that maybe almost every organization, at least the larger ones, got their own logo. What a great way to build up buzz and anticipation, and kudos to Apple’s PR people. Adobe has already announced full Photoshop for iPads (unspecified models) in 2019. I’ve made a video offering my predictions for what we’ll see at the October event. Currently in beta, but for Pro iPads only. I’ll bet it’s just running on Adobe Cloud. I’ve got the CS5 Suite, and I’ll be using Illustrator, InDesign, Acrobat and Dreamweaver almost as much as Photoshop. And I usually have more than one Adobe app open at once. And I don’t need or want to shell out big bucks for a subscription every month. That’s the case. CC subscribers only apparently. I’m also on CS5 Design Premium, but I only use PS and ID. I’m migrating away from ID, the Affinity Publisher beta seems to cover my needs for my own projects, I’d be happy to settle for a cheaper alternative and pay for updates. PS is still the king of course but my needs are generally covered by Capture One, it wouldn’t be a big jump to using Affinity Photo or Photomatix Pro and dropping PS once my OS stops supporting it. On a side note I jumped to Mojave, and PS and ID still work. Did TidBITS get an invite? I want a new iPad Mini! So would I. But considering how they treated the SE and the Mac mini, I’m definitely not counting on that happening anytime soon. I started out with an iPad 1, then an iPad 3, which was replaced by my iPad Mini 3. I do a LOT of ePub reading with the iPads and the Mini is the best form factor. If there won’t be any more iPad Minis then, I’ll either have to get a totally separate ePub reader, or go to an Android tablet the same size as the iPad Mini. Of course, that means I’ll have to replace my iPhone 10 with an Android phone, and of course I’ll then have to leave Apple computers after 34 years and move to a Chrome OS computer to go with the Android hardware! Horrors! No, Apple never invites TidBITS to anything these days. We’re too small. Bummer. You’d think they would make sure that long-time pro-Apple news providers would have primary seats. I hope they didn’t invite the Apple-hating ZDNet! For those who don’t know, BAM, despite the word ‘academy’ is not a school, it’s more like an avant-garde Lincoln Center, theatre meets dance meets film etc. They generally don’t do corporate hostings like this, it would have been debated internally, despite the obvious financial appeal. The BAM is a great venue to make an announcement about content creation, distribution and creativity. In addition to having evolved into a cultural institution, it was instrumental in helping to transform downtown Brooklyn from a blighted area into the hot, hip and trendy residential, commercial and artistic renaissance hotbed it is today. It reminds me of when Apple opened one of its very first Stores in Soho, what was then like what downtown Brooklyn is today. Everyone thought it was dumb to open a retail outlet for computers in a neighborhood called home for a bunch of artists, musicians, actors and some upstart ad agencies and production companies. It’s great PR for the BAM. While people in the NYC area might know the BAM’s stellar reputation, it’s spreading the word across the globe. it was instrumental in helping to transform downtown Brooklyn from a blighted area into the hot, hip and trendy residential, commercial and artistic renaissance hotbed it is today. It certainly was, the visionary Harvey Lichtenstein, an extraordinary man, transformed the dilapidated building, where the most significant event was a regular Kung Fu class, into what it has become. Sigh. I remember when I was a nobody developer supporting some minor freeware and shareware apps, when out of the blue I got an invitation to fly to Cupertino at Apple’s expense to meet with Jean-Louis Gassée because Apple felt it was important to keep in touch with grass-roots players in the Mac economy. I once was invited to the WWDC keynote by Michael Mace, then a VP at Apple, because he was shocked I hadn’t been included. Unfortunately, it was last minute, and I was dealing with minor back injury, so I had to pass. We have been included in press briefings with Phil Schiller at Macworld a few times, but for the most part, they weren’t terribly useful. At that level, though, the executives do speak more freely.